DICKINSON - When the crew of Apollo 11 splashed down in the Pacific Ocean on July 24, 1969, they were welcomed from afar by cheering crowds and President Nixon. Others, however, got up close and personal. John Hirasaki, 63, a 1959 graduate of Vidor High School, was one of two men who volunteered to risk spending time with the astronauts in NASA's mobile quarantine facility. "The National Academy of Sciences made it mandatory that we take precautions. There was a concern of potential contamination from another (space) body," Hirasaki said. 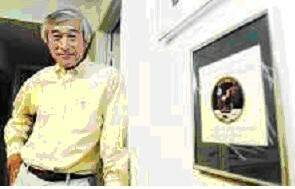 John Hirasaki, a Vidor High School graduate, worked on the Apollo 11 mission and was even quarantined with the astronauts after their return from the moon. Before they were plucked from the water by a waiting helicopter, Apollo 11 astronauts Neil Armstrong, Edwin "Buzz" Aldrin Jr. and Michael Collins donned special suits to isolate them from the environment before being flown to the aircraft carrier USS Hornet. Instead of handshakes from politicians and hugs from their families, the astronauts joined Hirasaki and Dr. William Carpentier inside a highly modified Airstream trailer that served as the mobile quarantine facility during their journey back to NASA's Houston space center. "All throughout when we were being offloaded from the ship and being transported to Hickam (Air Force Base), there were people lining the route," Hirasaki says of landing in Hawaii. 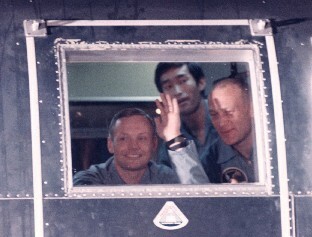 John Hirasaki, center, Neil Armstrong, left, and Edwin 'Buzz' Aldrin Jr. peer through the window of the mobile quarantine facility during their journey from the USS Hornet to NASA's Houston Space Center. "It's intoxicating and you could feel the excitement on the outside of the mission and the event," he said of the crowds who welcomed the crew home. "You could see it in their expressions and posture." The 65 hours he spent with the astronauts in the trailer were not spent lying around. Throughout, the astronauts were debriefed, wrote reports and had medical exams. Along with being the facility's maintenance man, Hirasaki was busy unloading the priceless cargo of moon rocks and film the crew brought home to Earth. That work was done in a containment facility on the ship. "One of the interesting things I noticed was that there was a unique scent I hadn't noticed on other Apollo capsules," Hirasaki said about opening up Columbia, Apollo 11's command module. "I attributed it to the dust they picked up on the moon," Hirasaki theorized. "It smelled like after you strike two pieces of flint together, or like a firecracker." Hirasaki's wife, Parrish, who also worked on the Apollo program, commented that her husband was the fourth person to smell lunar dust. Although most of the rocks were stored in specially made containers designed to protect them from Earth's atmosphere, there was one small bag of samples Armstrong collected and kept with him in case anything happened to the larger cache. "We looked at them, but we didn't touch them because that would mess up the sample," Hirasaki said of seeing the moon rocks for the first time. Once they returned to Houston, the quarantined astronauts, Hirasaki and Carpentier were joined in the Lunar Recovery Lab by a small group of other specialists for the remaining two weeks of isolation. During this time, Hirasaki said his wife - whom he married in December 1968 - would come to the lab and visit with him from the other side of a window in the lab wall. They talked by phone. "Like prison," Parrish Hirasaki joked. Hirasaki remembered that one day while he was working on Columbia during the last week of their isolation, the crew members visited with him and their ship, which was in another section of the Lunar Recovery Lab. "The crew came down and autographed the craft," Hirasaki said. "They commented on how good a bird it was and how it took them to the moon and back." After three weeks of quarantine and no signs of strange illnesses in any of the crew or recovery team, they were let back out into the world. "It was great," Hirasaki said. "Just to be able to have the freedom to roam, breathe fresh air again and have the wind in your face." Hirasaki still is involved in the manned space program, working for a NASA contractor. He said his best memory of the Apollo program was just the chance to be involved in one of the most significant exploration programs of all time. "I grew up in the country and went to a local high school and college," said Hirasaki, who graduated from Lamar State College of Technology, now Lamar University. "But with that degree, I was able to participate in something as fascinating as the lunar landing program," Hirasaki said. "For children, getting an education can get you a foothold and a ticket to the stars and the moon and wherever you want to go."